The story behind Charlie’s Chalk Dust is fascinating to say the least and has brought to life a vivid and charming brand that has an original take on vaping. 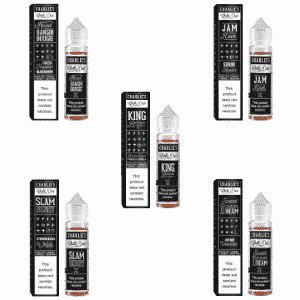 When looking towards vaping products invented by Charlie’s Chalk Dust, you won’t be disappointed. Interesting, unique packaging and flavours to delight and astound the most veteran of vapers. Dream Cream is a smooth vanilla cream with a spicy hint of cinnamon and swirls of fudge. Dream Cream is more than dreamy, it’s ‘McCreamy Dreamy’! Head Bangin Boogie is a tropical blueberry burst of flavour that will make you want to put on your boogie shoes! Jam Rock – Always lurking by the checkout counter, just bating you to beg your mum for the sweet and sour apple sweets! Well no more waiting for mum to give in, Jam Rock on my friend, Jam Rock on! King Bellman is a brown sugar tobacco with soft vanilla. Slam Berry tastes like fresh red strawberries ripened on the vine, mixed with sweet homemade ice-cream. A truly creamy strawberry ejuice shake!